Audio download read by Dr. Lillian Glass, In her best selling book, Toxic People, internationally acclaimed behavior analyst, communication and body language expert Dr. Lillian Glass showed millions of readers how to heal and deal from those who made their lives miserable- those who seek to injure their self confidence and well being. Now she takes you from toxic to terrific so that you can surround yourself with those who add joy and benefit to your life. You will learn the secrets fo terrific people from how to best communicate with others, Other topics include: overcoming shyness and insecurity and developing self confidence, eliminating loneliness and boredom, feeling comfortable taking risks with people identifying and being on the lookout for the 20 types of terrific people who can add to your life, and how to be a terrific person to those around you. 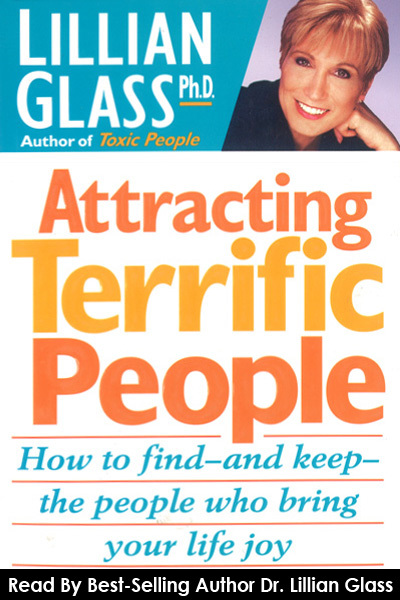 You will learn how to attract the Anti- Narcissists, Generous Givers, Non Judgers, Cheerleaders, Loyalists Good Mouthers, and Win-Winners to name a few.